The Buffalo Bills have reportedly released offensive tackle Cyrus Kouandjio. Last season, Kouandjio’s overall grade of 76.7 ranked 34th among 78 qualifying NFL tackles. 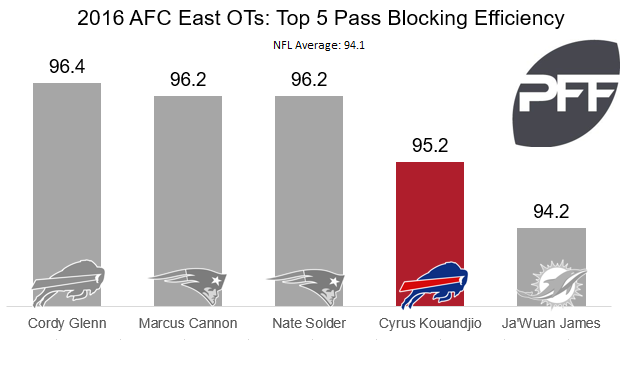 Kouandjio was also 29th out of 74 tackles with a pass-blocking efficiency of 95.2. Over 207 pass-blocking snaps, Kouandjio didn’t allow a single QB hit, and surrendered only one sack. However, he did allow 12 QB hurries. Kouandjio’s playing time did increase from 2015, as he went from playing only 234 snaps due to injuries to 406 in 2016.